WHY GO: Come to Wilmington DE to be immersed in all things DuPont. Begin with Pierre Samuel and his son E.I at Hagley, and continue on to the French and American palaces of Winterthur and Nemours. Attractions in the greater Wilmington area can be daunting, many require a full day to explore. But no fear, the Getaway Mavens are here – guiding you to the most curious and intriguing displays of industry, ingenuity and wealth with a side of great dining and luxury bedding. 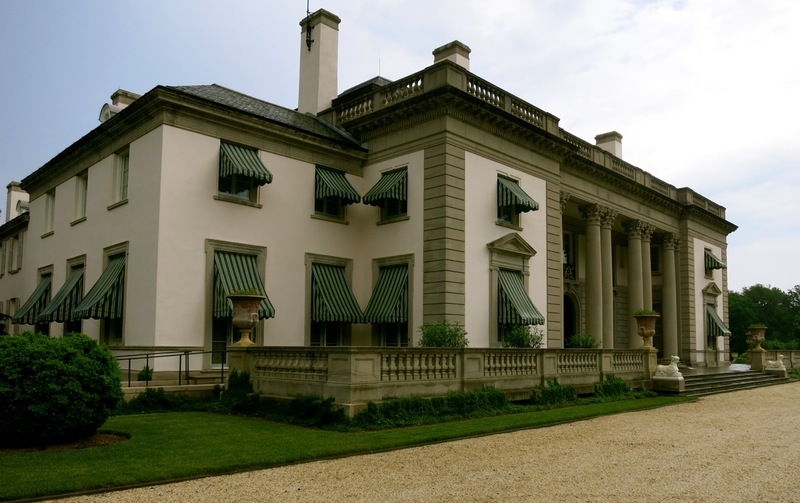 TOUR: Hagley Museum. This is where the DuPont saga began. In service to King Louis XVI, Pierre Samuel DuPont was bound to loose his head when he escaped Revolutionary era France with his two grown sons, Éleuthère Irénée (I.E.) and Victor, to the fledgling United States. In 1802, the DuPonts built the first version of their ancestral home, where five future generations would live, here on a dip in the Brandywine River. Improving on an ancient Chinese form of gunpowder, E.I Dupont established what was to become one of the country’s foremost chemical companies. Begin in the Visitor’s Center where you’ll find working dioramas, and take the good part of a day to explore all 235 acres, with over 70 structures, including a small Neoclassical building that served as company school for 150 children (only on Sundays when they weren’t working in the mill: and each child was encouraged to practice their own religion as E.I. and Victor were Diests). 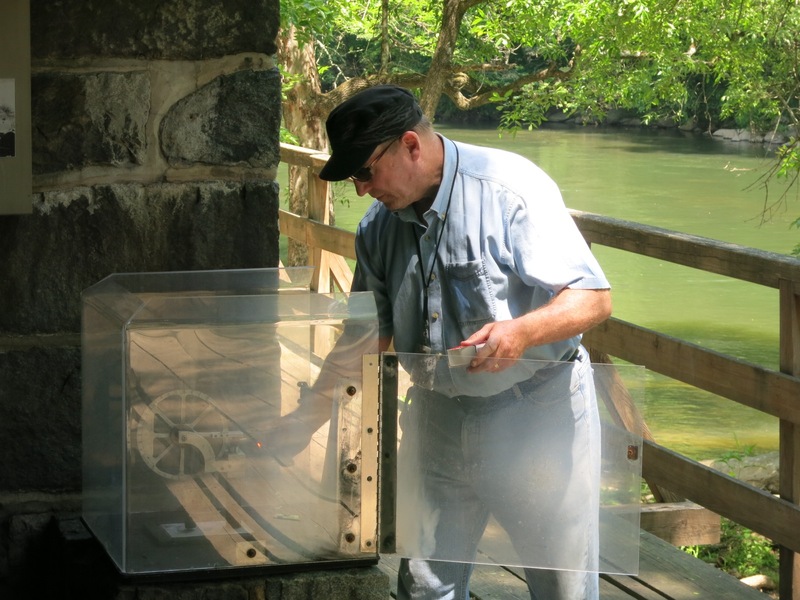 Don’t miss a working demonstration of shapers, lathes and other 1870’s machinery in the Machine Shop (on the half hour). As there were no Lowes or Home Depots around, this was primarily a repair facility, with hydro-powered cutting machines connected by leather straps to a centerline shaft. Kids as young as 8 years old who showed promise could earn five cents an hour, ten hours a day, six days a week as an apprentice. DuPont gave them half while they learned, then the saved portion with 6% interest added when they became full-fledged workmen. 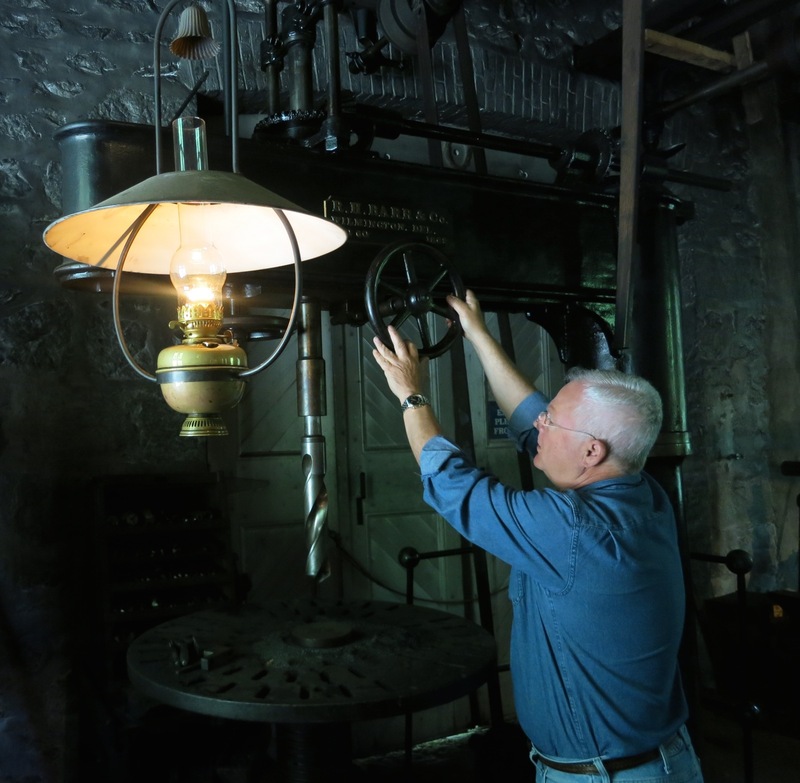 Smell the kerosene, watch these oiled machines at work, shards of metal flying helter skelter – it’s a thrilling way to learn about early industrial life. The other side of the machine shop is equally intriguing – illustrating how 75% Saltpeter, 12.5% sulfur and 12.5% Black Willow charcoal combined to create Black Blasting Powder. These exciting, moving dioramas depict all aspects of the powdermaking process: preparation, production and packing. Next investigate the Roll Mills – there were once 33 in all – where two rolling steel wheels as heavy as school buses, ground the powder to the consistency of pepper flakes. Made of Gneiss stone – a dense granite – mill buildings were open only to the creek, preventing blasts from destroying workers homes. Crouch behind a stone for the “quality control test” of the blasting powder – just a teaspoon causes a loud bang and lots of smoke. One ounce – a plastic film container’s worth – could throw a 24 lb cannonball 200 feet. 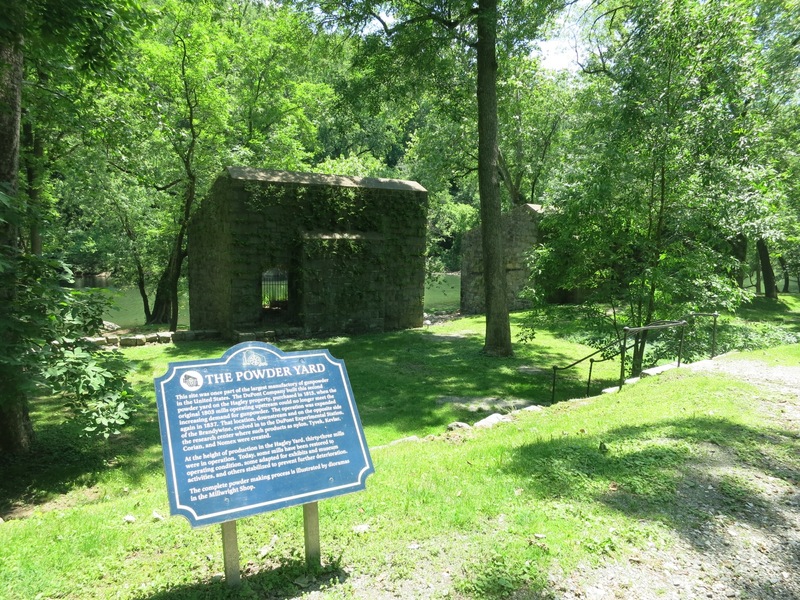 There were 288 explosions during the 117 years of Hagley Mill operation, leading to 228 deaths (known as “going across the creek”). The DuPont’s were altruistic for the time, allowing widows and families to continue living in company quarters for the rest of their lives. Take the bus from the Visitor’s Center to E.I.’s house on the hill – Eleutherian Mills – which was expanded and prettied up over the years by subsequent generations. It’s original footprint was small, the home wracked by explosives from the mills downhill, and micro-manager E.I. was known to shout orders from his balcony through a bullhorn to his workers below. He died in 1834 of a heart attack, hugely in debt, and was never able to enjoy the wealth and prestige of future DuPonts. Plan to spend a full day or at least four hours here. There’s even an organic café – Belin Organic Restaurant – on site that serves great soups and salads. Open daily 9:30-4:30, $14 adults, $10 kids. Closed Thanksgiving and Christmas. TOUR: Winterthur. 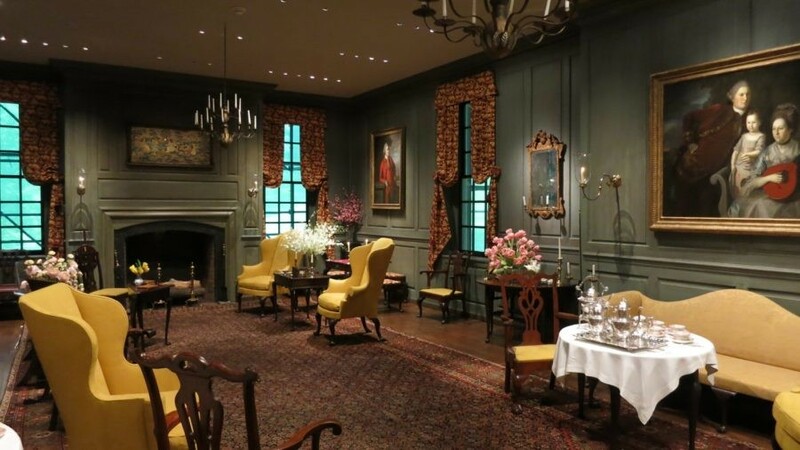 An exhibit in the Visitor’s Center of Henry A. Dupont’s 175-room museum/home, expanded from 40 to 150 rooms between 1928 and 1931, invites you to consider Colonial-era American dress and décor from various perspectives. 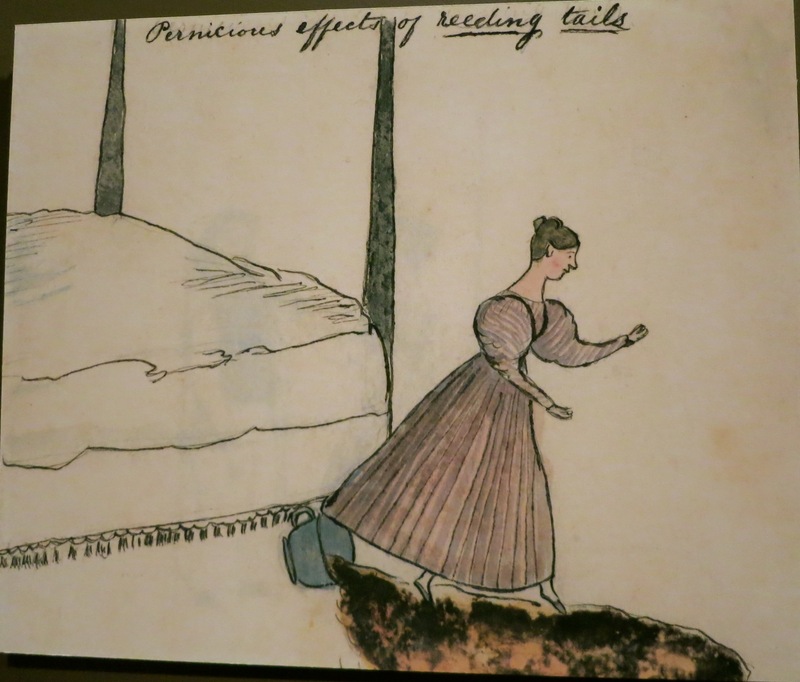 My favorite is a watercolor titled, “Pernicious effects of Reeding Tails” – a graphic depiction of what happens when a long petticoat snags on a full chamber pot. These slice-of-real-life vignettes come at you fast and furiously during a mind-blowing introductory tour, as you walk through narrow lamp-lit and low-lit corridors to one enthralling room after another. Henry collected rooms from American Colonial homes in all 13 original U.S. colonies and transferred them beam by beam, crown-molding by crown-molding to his mansion. 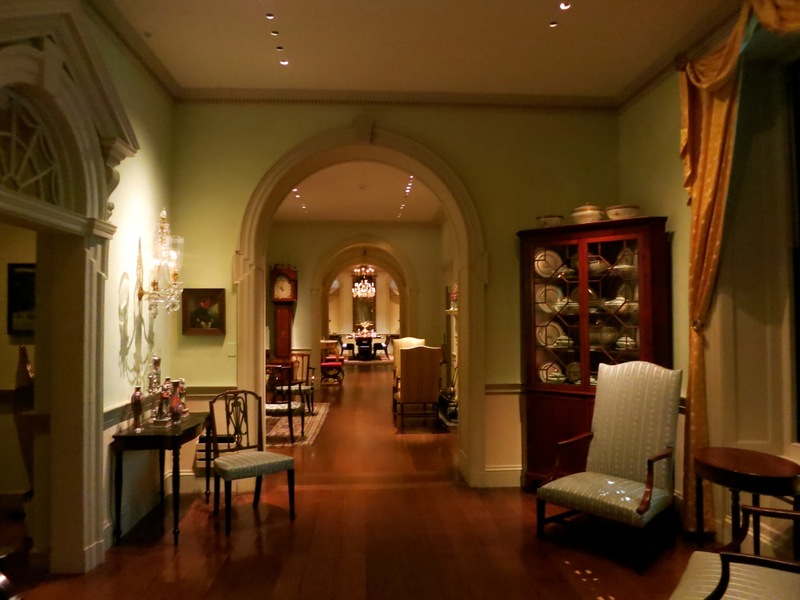 Arranging dozens of existing antique rooms into an already-built framework was an engineering marvel in itself – a feat that fascinates architects even today – and it is one reason that Winterthur is a draw for those who don’t care a whit about decorative arts. But for those who do, you’ll positively drool over 90,000 pieces of furniture and trimmings – among the most famous a porcelain china set that belonged to George and Martha Washington and a full set of six silver tankards from the studio of Paul Revere circa 1868. The large and colorful Chinese Parlor showcases Henry’s insistence on one type and hue of flower per vase (for some reason, he didn’t like multi-colored flower arrangements), hand-painted Chinese wall coverings, and a Steinway Grand Piano. An 1822 Spiral Staircase from a North Carolina property came with the plaster crown molding from its original home. 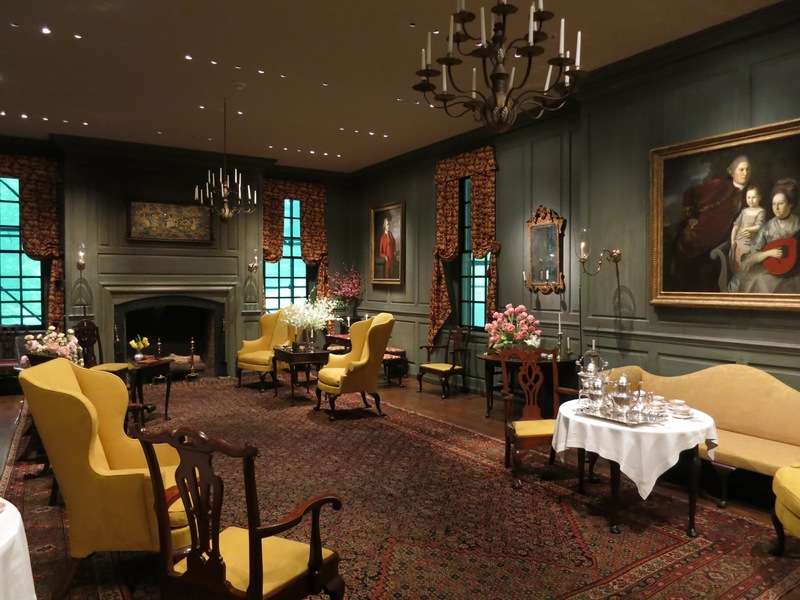 The 1740 Marlboro Room (Maryland) is set for afternoon tea, bright yellow seating positioned for optimal conversation. 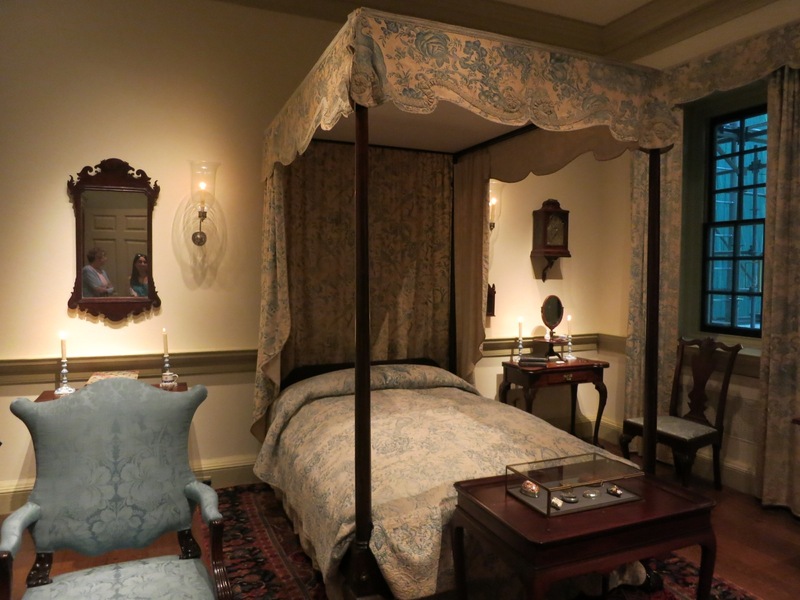 Yes, Winterthur is a showcase, but it was also the DuPont’s home, and 80% of what you see are the rooms they lived and entertained in. 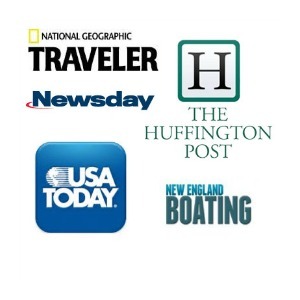 Choose among six tours or arrange a customized one to suit your own interests. Open Tuesday–Sunday, 10:00 am–5:00 pm. Last tour tickets sold at 3:15 pm. Last tour is at 3:30 pm. $20 adults, $5 kids. 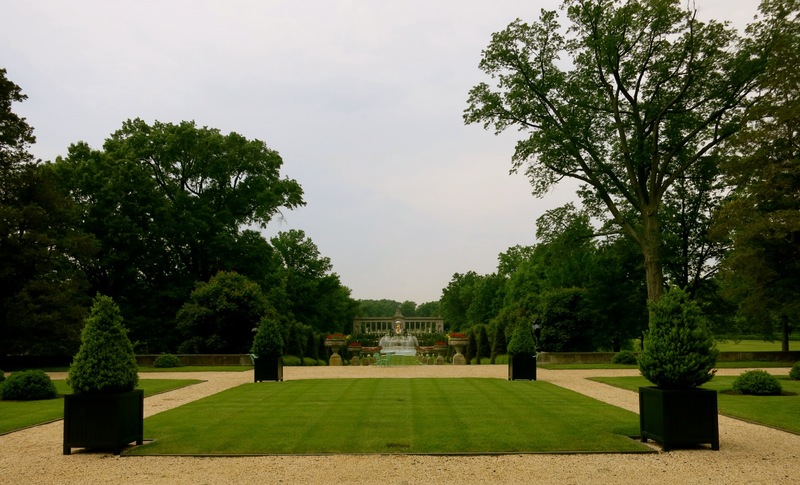 VISIT: Nemours Mansion and Gardens. After a recent $39 million renovation, Nemours well illustrates the story of Alfred I. DuPont, who built this 47,000 sq. ft. Versailles-like French château in 1910 at age 46 to woo his ladylove. The grandson of E.I DuPont, Alfred was orphaned at 13 and a full partner in “Uncle Henry’s” Black Powder business by age 25. An inventor who held over 200 patents, Alfred was what these day’s we’d call a nerd but was loved and considered one of the boys by Hagley’s “powder men.” Not particularly flashy, Alfred believed that Alicia Bradford would love him if he treated her like a French Queen. So he hired Carrere and Hastings, the same architectural firm that designed the New York Public Library, to build Nemours. From most accounts, though she married Alfred and bore him two children who died young, Alicia never came around to loving him before she passed away in 1920. Begin with a wonderful 15-minute movie to learn about Alfred’s hard-working and relatively humble life and strife, and about his happy later years. The tour takes you through this stucco and limestone mansion outfitted with many of Alfred’s inventions, including a wind meter that would indicate whether it was a motorboat or sailboat day, and a stained glass window that opened up. Upstairs, in the more genteel areas, you find historical pieces like the grand chandelier – a gift from Marquis d’ Lafayette to Pierre DuPont and a clock in the reception area made for Marie Antoinette (which was on loan to the Metropolitan Museum in New York and now back in its rightful place). Real birds reside in the Victorian birdcages in the conservatory, and for those in search of curiosities – there’s a Greco-Roman “tear bottle” used by mourners just sitting there on a shelf. The kitchen features a rotating silver vault and a set of personalized Limoges china specifically for the DuPont’s yacht. Forced out of his own company by his cousins in a hostile takeover in 1915, Alfred, 57 and a widower, had reached a low point in 1920 when he married his third and most loving wife, Jessie Ball – 20 years his junior. This proved to be the happiest season of his life, and most profitable. The DuPonts invested in Florida real estate in 1923, just as land values were increasing. When he died at age 70, Alfred left a fortune in a charitable trust, which is now worth billions and funds the Nemours/Alfred I. DuPont Children’s Hospitals in both Wilmington, DE and Orlando, FL. Jessie lived in Nemours until her death in 1970, often entertaining hospital board members in the grand dining room beneath the portraits of King Louis XVI and Marie Antoinette. Sunday: 12:00pm & 3:00pm, $15. VISIT: Mount Cuba Center. In 1934, Pamela du Pont Copeland transformed a fallow cornfield with no bio-diversity whatsoever into a thriving ecosystem with ponds, woodlands, meadows, and bogs. 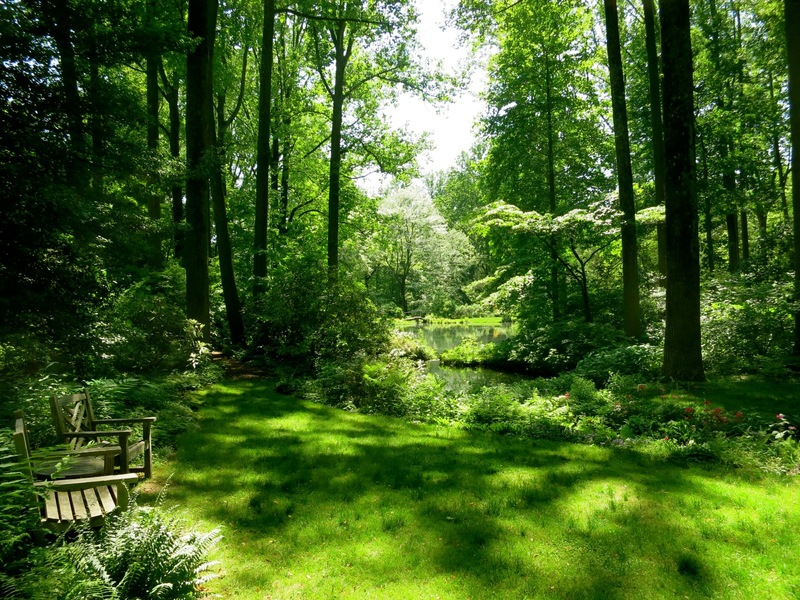 Now, you’re invited to walk rustic mulched paths to a lily-padded pond that puts one in mind of Monet’s Giverny, past Lady Slippers and Pitcher Plants (digesting bugs), signs with poems on the back and other surprises on 50 cultivated acres and 500 natural acres. 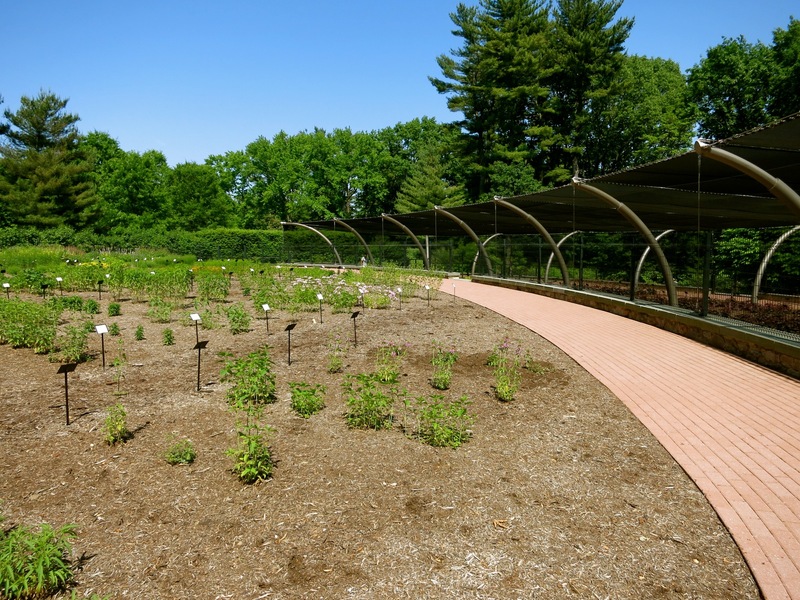 Opened to the public in 2001, the Mount Cuba Center is newer than other area gardens, but with “old bones” and a mission: to introduce native landscape perennial and shrubs with exceptional ornamental attributes and garden adaptability.” To that end, hybrids of native ornamentals have been planted in a “Trial Garden” – half shaded and half open to the sun – where researchers are studying the hardiness of various plants. The Copeland’s brick mansion now serves as Mount Cuba’s staff offices and for now, the place is open only 2 days a week. But you can sign up for Yoga and Ti Chi classes in the gardens. Open 10-4 Fridays and Saturdays Mid-April thru October, $6 adults, $4 children. 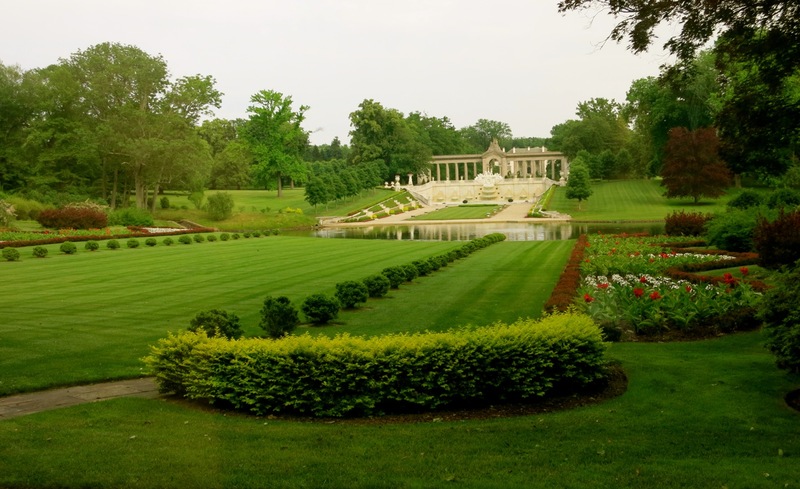 Two hour Garden Tours Thursdays at 10am and Sundays at 1pm April through October, $10. STROLL: Wilmington Riverwalk. The famous boat that carted 4,500 Jewish War refugees from France to British Mandate Palestine, The Exodus, was built right here on land along the Christina River. Once a center of ship and railcar industry, the Wilmington riverfront is now a charming esplanade lined with townhomes, high-rises, shops and restaurants. 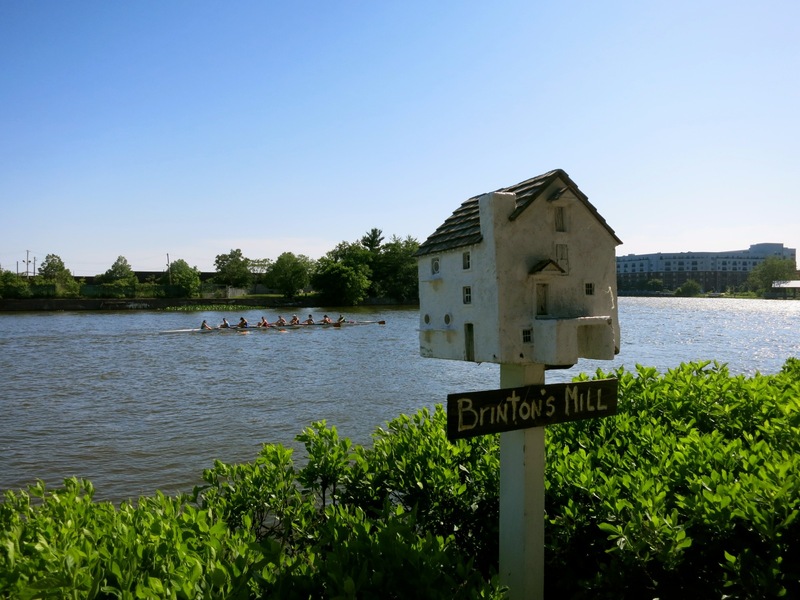 It’s a serene walk past whimsical birdhouses designed by a local artist, Tom Burke, and rowing crews practicing on the quiet water. 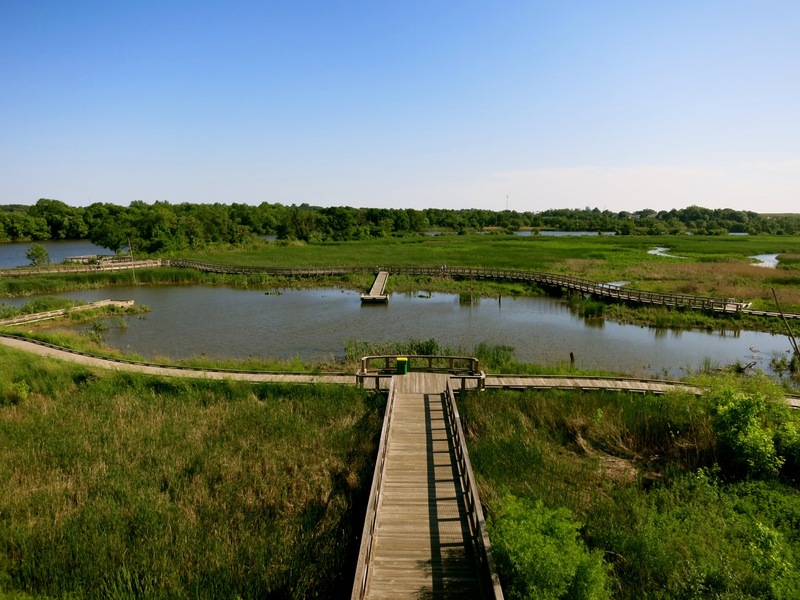 A former railcar factory is now home to the Delaware Center for Contemporary Arts, and the stunning “industrial chic” Russell Peterson Urban Wildlife Refuge has been carved from 212 acres of marshland. 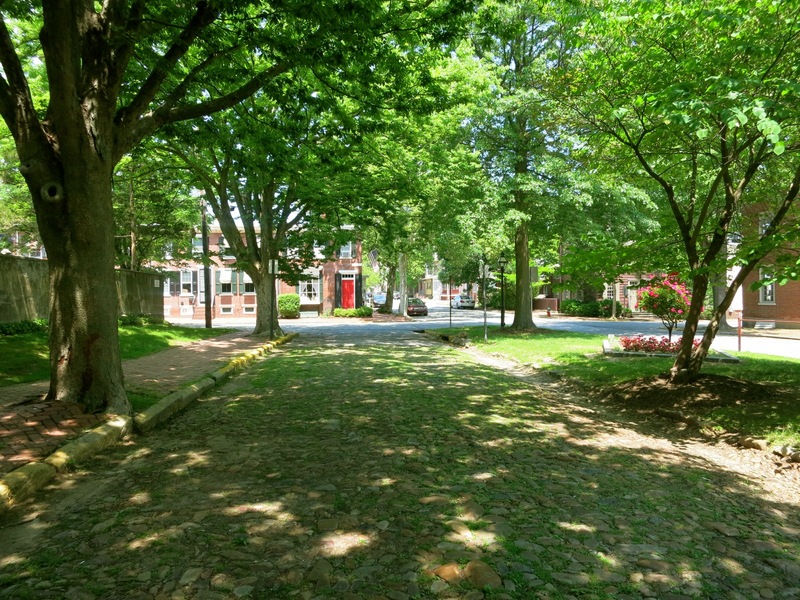 Over a mile, this charming esplanade connects several restaurants and museums and the environmental center – and places you within reach of café-rich Market Street. VISIT: Delaware Museum of Art. Several structures make up this sunlit museum, with a concentration on “Art of Illustration.” Naturally, there are a number of Wyeth pieces, as well as those of N.C. Wyeth’s mentor and Wilmington native, Howard Pyle. 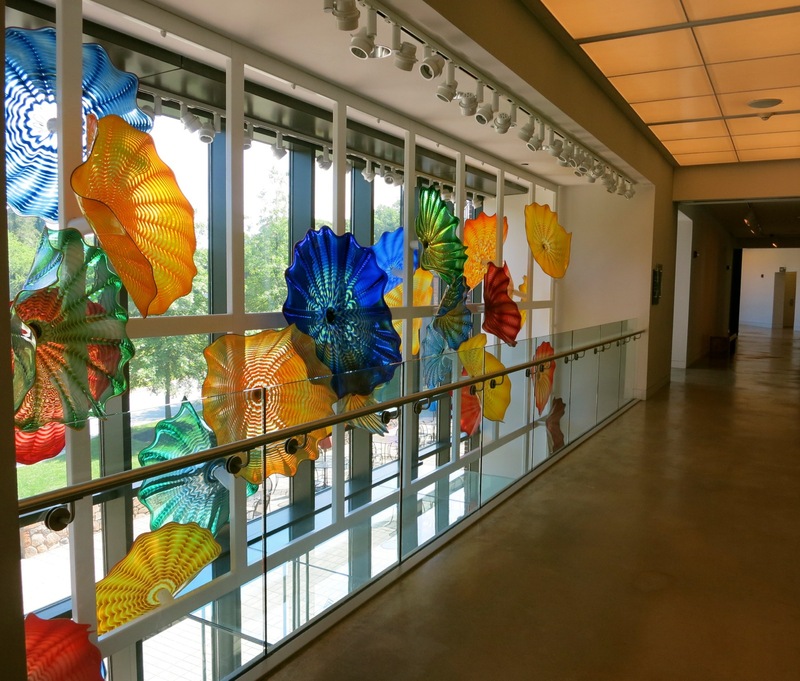 The “Chihuly Bridge” – a windowed skywalk featuring a cluster of colorful glass art – is particularly striking. VISIT: Historic New Castle. Not to be confused with the new New Castle, this 6 block historic district is so authentic (if you remove the cars), it served as backdrop for the Oprah Winfrey movie, Beloved. 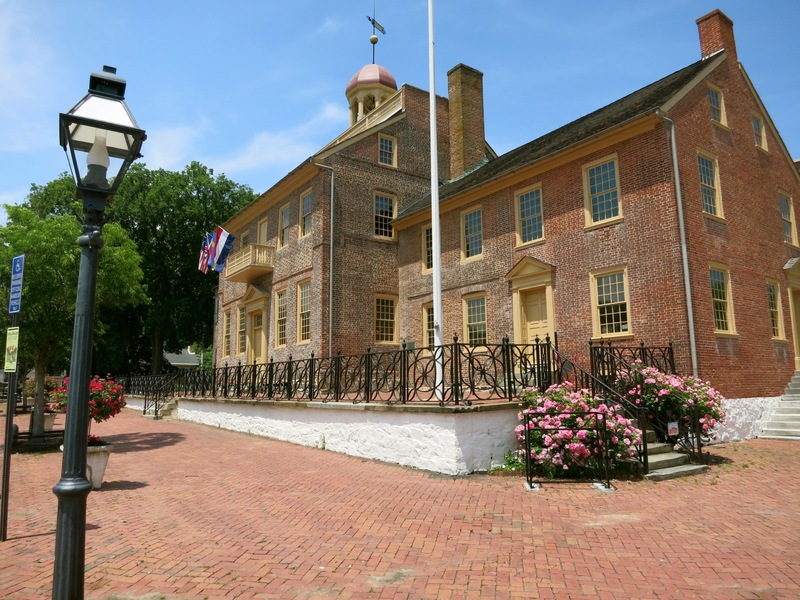 Some of the red brick townhomes, shutters in black and Federal Blue, were here when William Penn arrived in the New World, and at one time the copula that sits atop the Courthouse (a newly designated National Historic Monument) served as the border between Delaware and Pennsylvania. Wander the original cobblestone streets (FYI, wear comfy shoes) and seek solace in the old church graveyard: Many stones date to the early 1700’s and are perfect for rubbing. Pop into the Read House – facing the Delaware River – built for George Read, one of the signers of the Declaration of Independence as the finest home in Delaware. 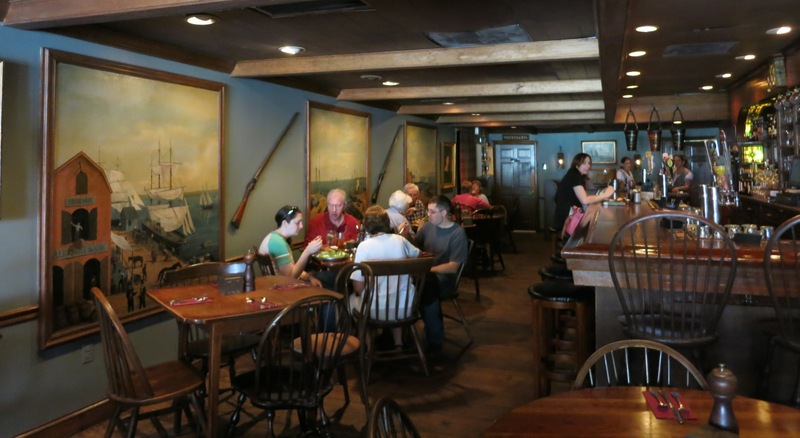 To round out your colonial experience, eat Fried Oysters or a Reuben on a Dutch Pretzel Roll off pewter plates at Jessop’s Tavern and Colonial Restaurant. In a three hundred year old barrel-making shop, it’s a throwback for sure, with ale tankards, colonial fare and waitresses in period dirndl skirts. EAT: Krazy Kats at Inn at Montchanin Village. Named after a woman (purportedly koo-kooo) who lived here in the 1800’s, you’ll dine in clubby luxury surrounded by portraits of aristocratic cats and dogs. Known for its wild game (e.g. Smoked Rabbit Chowder) and marvelous Crab Bisque, the chef does an expert job with Lamb Porterhouse ($18 for one chop, $34 for 2), perfectly coated Caesar Salad, and flash-fried caramelized Brussels sprouts to die for. EAT: Green Room at Hotel DuPont. With walls and ceiling of gorgeously carved wood, this exquisite dining room, a throwback to the 20’s and 30’s, is feast for the eyes as well as the palate. 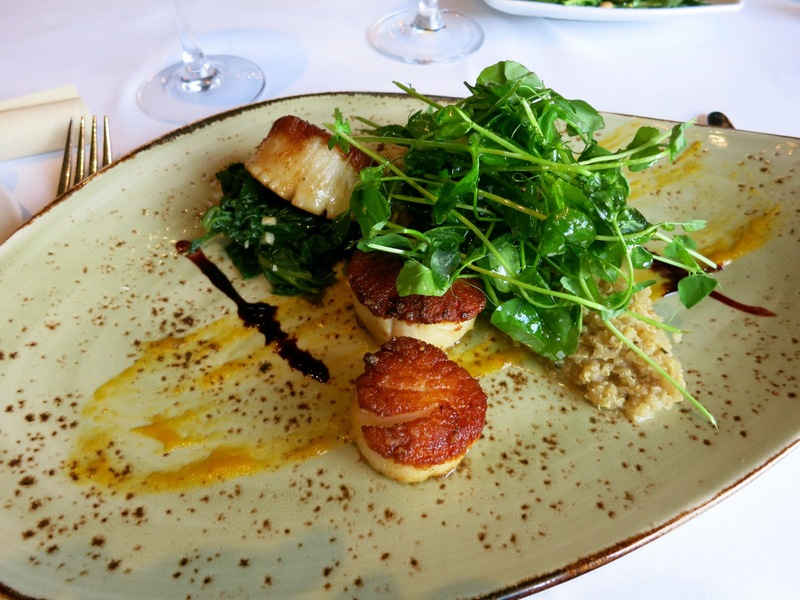 I would have been content with the plate of mouthwatering diced, fried, sautéed and grilled mushrooms ($14) from nearby Kennett Square, if it wasn’t for the perfectly executed Diver Scallops ($38) seared to a golden crisp. 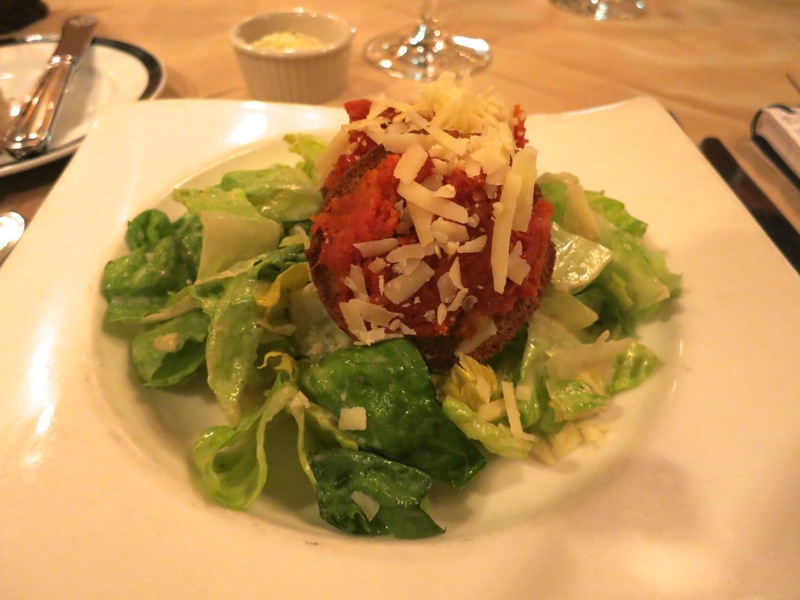 Once known for its tableside-made Cesar Salad, Green Room chefs bring this tradition back for special occasions. No meal is complete without the restaurant’s signature macaroon cookies, brought to you with the check. You’ll want to take home a box. Six course tasting menu, $110. EAT: Other recommendations by locals include LaFia on Market St. helmed by a James Beard finalist, Harry’s Seafood on the River Walk, and Buckley’s Tavern in Centerville where you’ll park your car beside Rolls Royces and wear P.J.’s to get breakfast 50% off the $18.50 Sunday Pajama Brunch. STAY/SPA: Inn at Montchanin Village. One of the finest and surprisingly whimsical places to stay in the greater Wilmington area, the Inn at Montchanin Village once housed the laborers who worked across the street at Hagley Powder Mills. It’s now a luxury inn, and deserved its own Getaway Mavens write up here. Rooms and suites from $192-$379 include free parking, wi-fi, coffee/tea and all the Hershey’s Kisses you’ll ever want. 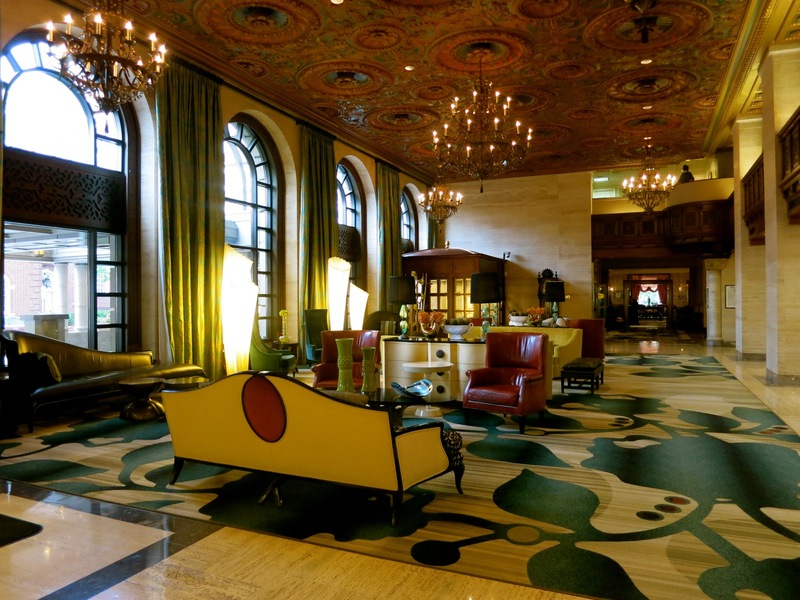 STAY: Hotel DuPont. A grand dame of Wilmington, the Hotel DuPont was built by Pierre Sam DuPont (owner of Longwood Gardens) in 1913 to host corporate owners and executives. It remains the place to stay in downtown Wilmington, and has kept its traditions going strong (house-made macaroons at turndown) even after a recent renovation. Room rates $200 (weekends)-$450 (midweek).